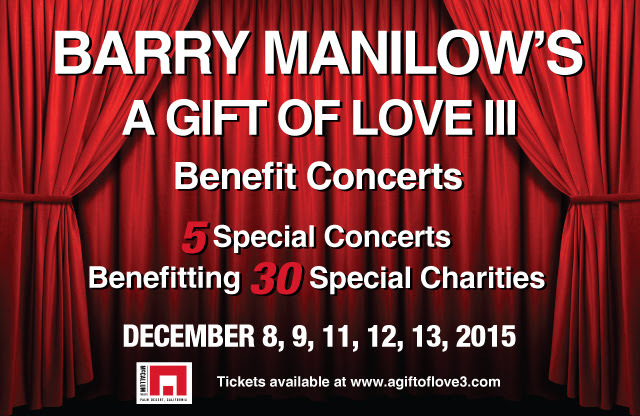 Advancing the Interests of Animals has been invited to benefit from Barry Manilow’s 2015 A Gift of Love Christmas Charity Concerts at the McCallum Theatre. Barry recently announced that he will contribute five more holiday concerts to raise funds for more than 30 charities in the Coachella Valley. Barry’s 2009 and 2012 concerts raised over $1 million, and he hopes to raise another $500,000 with the 2015 concerts. Scheduled to take place at Palm Desert’s McCallum Theatre, Manilow’s A Gift of Love III concerts will feature his hit songs and holiday favorites. Concerts are scheduled for December 8 and 9, and again on December 11, 12 and 13. You can support Advancing Interests of Animals by purchasing VIP Premium tickets. These tickets will go on sale exclusively online at www.agiftoflove3.com or by phone at 310.957.5788 on Wednesday, June 17 at 10 AM PT. Make sure to select Advancing the Interests of Animals as your charity in the drop down menu!